Iowa fall fingerlings being stocked at a Michigan lake. 2002 marked the first year of this program, which continued through 2007. MMA provided money to Iowa for feed costs to raise muskies from egg-take to spring fingerlings in their Spirit Lake Hatchery. In July each year, MMA arranged for transportation of 5-10,000 spring fingerling muskellunge from the Iowa hatchery to the Wolf Lake Hatchery in Michigan. 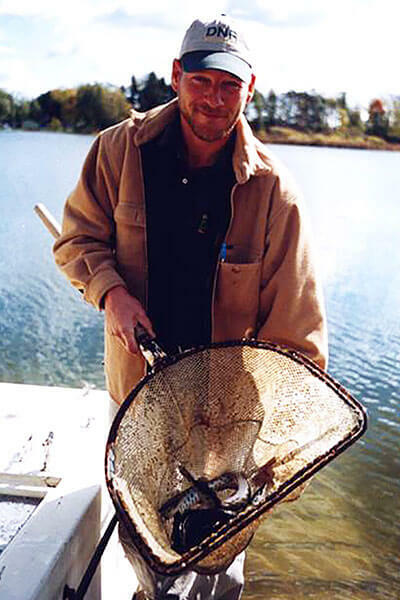 From July through October, the muskies were reared at the hatchery in Michigan, then stocked as fall fingerlings throughout the state. The partnership with Iowa has been responsible for stocking more than 40,000 muskellunge in Michigan. Most importantly, this program was a real boost to stocking numbers as the Michigan DNR worked to improve its own muskie rearing program.